If you thought that St Patrick’s Day was just about green beer, parades, three-legged races, craic and Irish music, think again! READ MORE: Everyone’s welcome at the St Patrick’s Day Parade! For the past eight years, Tourism Ireland has been celebrating landmark buildings round the world by turning them green. This year, it is the turn of the the Radisson Blu Royal Hotel here in Copenhagen. Brian Gleeson, who as his name suggests is originally from Ireland and who is general manager of the hotel, says that this is entirely appropriate. 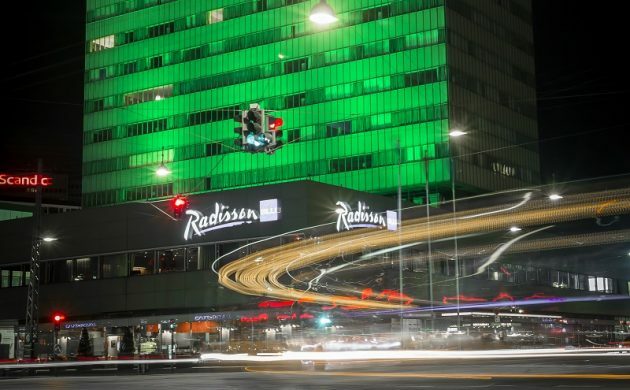 “The architect and designer of our hotel was the late and great Arne Jacobsen, whose favourite colour was indeed a shade of green, so I am sure he would approve of this,” he said. READ MORE: St Patrick would be proud! Copenhagen Harbour’s turned green, and just in time! And as Kermit from the Muppets memorably sings: “Green’s the colour of spring, and green can be cool and friendly-like,” so what could be more appropriate for Paddy’s Day? If the pictures are anything go by, you should be able to see the 70 metre-high hotel from afar, but if you’d like a closer look, it is situated on Hammerichsgade, almost opposite Copenhagen’s main railway station.